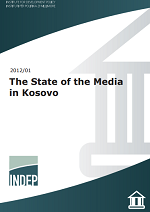 Kosovo’s media sphere has been the subject of a number of tumultuous changes in the past twelve years since the end of the war. Having been subject to regulation by a number of different institutions, the challenges facing journalists have been considerable. Some challenges, such as establishing a plurality of outlets, ensuring some sustainability and addressing legal concerns have been overcome to a large extent. On the other hand, more work is required to fully establish legal provisions for free speech, limit pressure toward journalists and ensure a professional journalism sphere.